I have this one!!! I forgot about it, it's been on my shelf for ages, but I still remember when I got it at a garage sale. Anyway, you have ne wanting to read this RIGHT NOW. I think I had forgotten what it was about. So thanks for the great review! Wow. A 5 star book that is so...different. I read Living Dead Girl which is sort of like this book and I was so shocked. I'm glad that you liked this one so much and now I want to read it too! I don't know what to think. Yes, I do think Gemma suffered from a form of Stockholm Syndrome, I do think she makes the right decision, I do think Ty is slightly insane, I do think he is a good person, I do think his axis in life is just a little off...but I don't see Ty as a monster and neither do I see Gemma as a tortured abduction victim. If anything, there is too much of a silver lining to this tale. It's sad and depressing and unhappy, but it's also right and true and beautiful. I hope you realise how perfect that paragraph is! I felt exactly the same way reading this book. I was so very confused by my own feelings, but I loved that Lucy Christopher was able to make that happen (without me even realising it at times). And gosh, the characters... I can't get them out of my head. Ty's voice still haunts me sometimes. I'm so glad to see this get 5 stars from you, Keertana. A really beautiful review! Great review! This was an amazing book. I'm going to meet Lucy Christopher herself in a few weeks. I AM SO EXCITED!! Everyone has such intense reviews about this! I'm kind of curious about it now, even though I wouldn't normally read it. Great review! Awesome review. This sounds like a thought provoking and intense read. I am glad that there isn't a romance it seems kind of out of place. I will have to go look this up now. Since I've started reading contemporaries, I've wanted to read this one, but I haven't picked it up yet. This is about as convincing as anything to pick it up. I hope I can get to it soon because WOW this sounds brutal, challenging, and also amazing. Love these thoughts! Stupendous review! I applaud you! You have intrigued me and made me want to go out to buy this book immediately so I could read it too. I was happy to hear there was no romance. Nothing straightforward like that. Instead, there's this beautiful, complex relationship between Ty and Gemma that makes you think long after the book is done, and that makes me want to read this so much. It sounds twisted but, at the same time, lovely. Very nice review :) I wanted to read this book for the longest time, and then when I finally got my hands on it I couldn't get more than a third into it. I guess it just wasn't for me. I definitely want to read this novel, but I think that I'll put it on hold for now with it not being a happy novel, I'm going off unhappy novels for a while. I did love your review which was a little more winding that usual, but I think that reflects the novel and your feelings and I liked that. The characters sound complex and I loved your choice of quotes that somehow managed to pinpoint the novel that sounds like it takes lots of different feelings and directions. I've been so interested in reading this book ever since I read Sam from Realm of Fictions' review! Keertana, I'm SO SO happy that you loved this one as well! The character relationship seems like a romance at first, but I can see where it strays off as more of a growing friendship-like thing. Man, I don't know if I can handle this book! It sounds so thought-provoking. Beautiful review, Keertana! Anyways, I think this one would be confusing read for me, because I always like to know who and what I root for, and I always want an idea of where the plot is going, which is something you didn't get until 90% apparently. But honestly, this book seems utterly beautiful, and I think this one is going to be a book that I'll be picking up soon. It seems like too much of an enigma for me to pass up. Stunning review, Keertana, this one was absolutely breathtaking. <3 Your reviews just manage to be getting better and better, even if I thought that wasn't possible! You know, after reading Emma Donoghue's Room, I wasn't sure I really had it in me to read another stolen/captured woman story. The genre just isn't that appealing to me and that book, at least, was a little depressing and disconcerting. But now I'm reconsidering my stance, at least for Stolen. I love how your review really focuses on how real and multi-faceted both the captive and the captor are to you. And how the novel itself seems to elicit so many diverse feelings while reading it. I'm not sure whether I can buy a captor being "good," but I am eager to figure this out for myself by reading the book! I am always in awe of authors that make me sympathize with situations that would normally make me cringe or say NO WAY could that work. This sounds like exactly that kind of book, one that could make you think for days and realize that life isn't always (or ever) just black and white. Is this book written in letter form? The sub-title makes it look that way? Also, the Australian Outback setting sounds fascinating as well. I love love books set in Australia. Hehe, I can tell when you are in love with a book because of how you construct those reviews, and I love it. I really want to read this one! I already did, but now I know that I MUST read this one, that it will be one of those contemporaries I can fall in love with. I love the complexities of these characters and their actions, and I LOVE that you didn't really fall in love with it until 7 pages before the end...certainly worth holding out for. 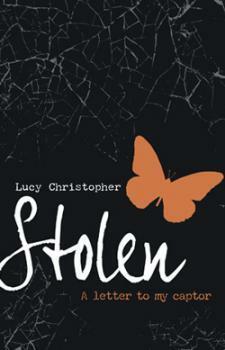 I bought my sister a copy of Stolen for her birthday back in June, I might have to contrive to steal it or borrow it or something. I love complexity. I actually love a desert setting too. I love a nice gray area as well.